Tornados Leave Destruction in Texas. Missouri and Arkansas affected. Tornados leave destruction in Texas leaving many people with damaged homes. People are waking up this morning from widespread tornados across Texas, Missouri and Arkansas. Flooding and tornadoes killed many people and dozens injured. According to the National Weather Service, they have confirmed at least three tornados swept through parts of three counties in Texas Saturday evening. In Missouri, the body of a 72-year-old woman was recovered after floodwater washed away her car. In Arkansas, another woman died Saturday after a tree fell on her mobile home about 80 miles east of Little Rock, according to police. In north Texas this horrible weather spread destruction and more than 50 people injured, officials said. 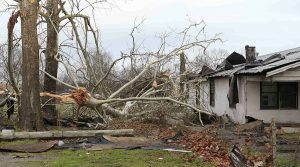 Tornadoes ripped through the states overturning vehicles, mangled trees and damaged homes. Today, more than 30 million Americans remain under flash flood watches and warnings as the storm moves eastward. It began hitting the southwest and Midwest states Friday.